Burger King Complies With Demand for Improved Animal Welfare Standards. People for the Ethical Treatment of Animals (PETA) "Murder King" Campaign, which has involved provocative ads, celebrity support from Alec Baldwin, James Cromwell, and Richard Pryor, and more than 800 protests at Burger King restaurants worldwide, has been called off following the fast-food giant's announcement today that it will exceed the animal welfare standards that PETA negotiated with McDonald's last year after similar protests. PETA is now eyeing other chains, such as Wendy's, as possible targets for animal welfare improvements. Will conduct unannounced inspections of its slaughterhouses and take action against those facilities that fail the inspections. Will establish animal-handling verification guidelines for all cattle, swine, and poultry slaughterhouses. Will give laying hens 75 square inches of cage space (3 inches more than McDonald's agreed to) and require that the birds be able to stand fully upright. Will require two water drinkers per cage. Will stop purchasing from suppliers who force-molt (starve chickens to force them to lay more eggs). Will develop auditing procedures for the handling of broiler chickens. Will institute humane-handling procedures for chickens at the slaughterhouse. Will begin purchasing pork from farms that do not confine sows to stalls. Says PETA President Ingrid Newkirk, "The only way to avoid cruelty in meat production is to go vegetarian, but today Burger King has taken giant steps to improve the lives of millions of animals. We are ending our Burger King protest and examining other chains, such as Wendy's, as potential targets for improvements in animal welfare." 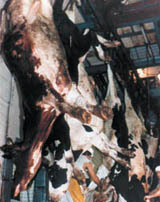 For more information, including videos of animals in factory-farm conditions, visit PETA's MurderKing.com Web site.